Harry Potter mania has come to Exeter. Yes, dur­ing a brief trip to the town centre this after­noon, we spied witches, wiz­ards and some extremely cyn­ic­al shop staff — the lat­ter not so sur­pris­ing, giv­en the efforts required of them over the past couple of days. But what really sur­prised me was the lack of stock. We have two branches of Waterstone’s in Exeter. (A strangle­hold that pre­vents the blos­som­ing of any inde­pend­ent shops run by staff who don’t need cus­tom­ers to spell Norman Mailer’s sur­name when ask­ing for his latest work, but I digress.) In the first branch, my enquiry about wheth­er any Potter volumes remained was met by a polite and amused shake of the head. Only those cus­tom­ers who have reserved a copy, appar­ently, are able to pur­chase it today. It was the same story at the second branch of Waterstone’s. Quite extraordin­ar­ily — giv­en the amount of dough that pub­lish­ers are wont to cough up for the priv­ilege — there was a large, empty table in the entrance­way. I struggle to under­stand how this can hap­pen. On the launch day of per­haps the most anti­cip­ated book of the last two years, Waterstone’s Exeter sold their stock by mid-day. Each per­son who asked for a copy (and there were a couple in front of me) was turned away. Did Bloomsbury delib­er­ately lim­it the amount that a giv­en store could shift? Possibly, but this seems counter-intu­it­ive. They can’t super­i­fi­cially kick up the value by throt­tling back demand in the way that Nike or Sony might with a new product. And, in fact, those new products (like the PS3) are more greatly lim­ited by the avail­ab­il­ity of mater­i­al resources like sil­ic­on. What lim­its are there on paper? Overall, the affair is puzz­ling. As Grumpy Old Bookman has opined, there can be no bet­ter demon­stra­tion of the oddness of the book trade than Harry Potter: the most sought-after volume in the past couple of years is going to make very little money for any­one oth­er than Bloomsbury. Two cop­ies were finally pur­chased in W. H. Smith, which seemed to have anti­cip­ated demand rather more accur­ately than Waterstone’s. Two cop­ies? So my girl­friend and I can read them with squab­bling. Not so sur­pris­ing — the book has sold far faster than pre­vi­ous volumes, ever-increas­ing reser­va­tions (or pre-orders or whatever you like to call them) as the release approached, while the cut off date for chains et al to place their order passed many weeks ago. They have to get the order as right as pos­sible — des­pite your pre­con­cep­tions the pub­lish­er don’t pay any­thing for all the incred­ible work Waterstone’s and oth­er real book­shops do to pro­mote Harry Potter, and returns are capped at 10%. No shop, big or small, can afford to get their order wrong. The mor­al is — though as it’s the last book it won’t come in handy — order early, join the mid­night queue, and enjoy the whole exper­i­ence whatever the weath­er. Bad luck your Waterstone’s had run out — but their lack of stock prob­ably means they did more right than WH Smith’s on the night, who most likely had stock left because fans pre­ferred what Waterstone’s had to offer come the witch­ing hour — more fun, a bet­ter price, bet­ter look­ing staff and the like. Thanks for your com­ment, anonym­ous. That’s a good point that the book­shops orders needed to be placed before the hype. The num­ber of reser­va­tions can increase while the num­ber of cop­ies can’t, lead­ing to few ‘buyable’ cop­ies on the day. Still, even with a 10% cap for the returns, I’m still sur­prised that W’s would run out a few hours after the launch. But without the num­bers I can’t be sure. ah, you’re still here! How’s the wrist? Is that two dif­fer­ent hard­back cov­ers or is one a trade paper­back? My daugh­ter has seen the movies, as she found the books a bit heavy. I’m not allow­ing her to see the cur­rent movie for anoth­er couple of years, so she’s hav­ing anoth­er crack at the books, when we’ve fin­ished ‘The Adventures of Sherlock Holmes’. Thanks, Helen. Actually, my wrist is much worse this morn­ing, which is a bit irritating…I can recom­mend the books, but you can’t beat the Adventures of Sherlock Holmes! The book prob­ably cost book­sellers around £10 give or take £1 (Bloomsbury usu­ally set HP dis­count rates across the board rather than dif­fer­ently for each indi­vidu­al cus­tom­er accord­ing to size of order), so any sale close to £10 (W at £9, WHS at £10, Tesco £10, Woolies £9) makes little if any profit, once costs of sale have been applied. 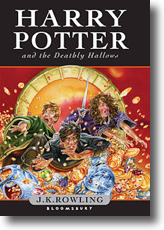 This year Bloomsbury set a 10% returns cap and HP is like Xmas but with only one book for sale, ‘every­one’ (most of the chil­dren and keen adult fans) wants it NOW not next week when the story has been widely broad­cast. I’ve heard of 5 Ws,2 WHSs and a Woolies that sold out over the week­end. They could have ordered more, but wouldn’t have made much more money, if at all, many pos­sibly reduced their losses by selling out, and might’ve been stuck with a children’s £17.99 hard­back or loss-mak­ing last week’s news. I’m sure most stores put loads of effort into a bril­liant mid­night and Saturday, I loved doing the HP night­shift when I worked in a book­shop, but maybe the com­bin­a­tion of the returns cap, lim­ited profit (except on HP ‘extras’ sales) and anti­cip­at­ory fear of lost sales to cheap­er com­pet­it­ors and Amazon prob­ably made the Hedwig Offices think less is more in this instance and staff on the front line just have to live with it and deal with the ensu­ing irrit­a­tion and ‘humi­li­ation’ (not so bad in the big scheme of things really) of run­ning out on the biggest selling (if not profit) day in his­tory. Thanks for your com­ment, Bellulah. That’s a good point about the kid­dies want­ing the book before the story becomes widely known. But would HP books really go unsold? I dunno. The hus­band and I had to have two cop­ies, as well, for the same reas­on; we read them at the same time though. No prob­lem here in the States, at least in Tennessee, with lack of cop­ies. Well, I say that–we got our reserved cop­ies at mid­night and they had dozens of unopened boxes left and I’ve seen plenty of cop­ies as I’ve vis­ited book­stores over the weeks. (Used book­stores being the excep­tion). I would tease you and expound on the import­ance of pre-order­ing Ian, but twas the last book, so it’s a moot point now. I have to admit that I nev­er fell under the Harry Potter spell. I haven’t read a single book in the series or watched any of the movies and have no desire to at all. I can’t say that they are bad or not worth read­ing (because I haven’t read them). I simply have no interest in them.